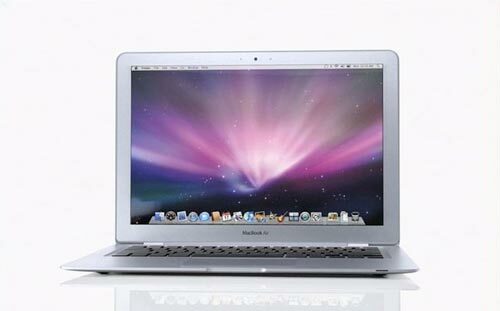 Apple has revealed another addition to its notebook lineup today at MacWorld 2008, the MacBook Air. The new Macbook Air comes with a 13.3 inch widescreen display, a full sized backlit keyboard, and 80GB HDD as standard and the option to choose a 64GB SSD as the main hard drive. Processing comes from an Intel Core2Duo 1.6GHZ as standard with the option of a 1.8GHz processor, there is also 2GB of RAM and there is no optical drive built in, an add on drive will be available for $99 or you can used a drive on any Mac through wireless to install programs on your MacBook Air. The touchpad features an intuitive interface like that of the iPhone and you can can pan, rotate, move entire windows, move between photos, all with simple gestures on the touchpad. The new MacBook air will ship in two weeks, but you will be able to pre-order it today for $1,799. Check out the full details over at Apple.